Every mother’s story is as unique and important as she is. Moms speak, we listen. 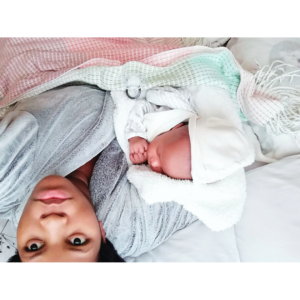 For our latest Meet The Mom we spoke to Masego Modisagae, a first time Mom. 1.) What word(s) would you use to describe your journey of motherhood so far? Paradoxical. That’s the best way to describe my journey so far. Magical, but overwhelming at times. 2.) When you were little, did you always imagine that you would one day be a Mom? Yes, I did. I’ve always loved babies and hoped to be blessed with my own one day. 3.) What has been the biggest surprise about motherhood so far? How underrated being a mom is. I’ve always known that mothers work hard, I just had no idea that they worked this hard. Motherhood isn’t as easy as the women in my life have made it seem. They made it seem so natural and effortless but reality is, even something as natural as breastfeeding can be challenging. 4.) What helps you feel better at your most stressful moments or bad days? My support system. I’ve gotten the best support from the father of my baby, our families and friends from the very beginning. My son’s smile also makes everything feel alright. 5.) How did you go about choosing a name/ names for your child/ children? My partner and I initially had names planned way before conceiving, however when the time came, we named him according to his role in our lives. We’ve been through so many stormy weather’s together, he’s the light and shine in our lives. 6.) Is there anything your mom taught you in childhood that is important for you to pass on to your own children? Unknowingly yes. It’s to make the best decisions for my children no matter how challenging or uncomfortable they may be, to always put my children’s happiness first. Take care of their emotional and mental well-being as it’s just as important as physical and financial stability. She taught me to be brave and selfless. 7.) What is some advice you would offer to a woman out there who is about to have a baby for the first time? Motherhood is not as easy as it seems, but it’s not unmanageable either. You’re going to do a great job. Be kind to yourself. Do not be hard on yourself, both you and your baby are new to this. Your child is your greatest blessing yet, no matter how frustrated you’ll get due to sleep deprivation, confusion and other challenges you will face in your journey, always remember that you’re blessed to have them.